Subaru, which is the owned Fuji Heavy Industries Ltd. (FHI), has released details on its third generation four-cylinder boxer (flat-4) engine that will be available in 2.0-liter and 2.5-liter displacements. The engine is been used on Subaru Impreza, Forester and Legacy models for some time. For start, the new boxer engine will be on the Subaru Forester. The second generation boxer engine was introduced in 1989. After 21 years, here comes the third generation from Subaru. 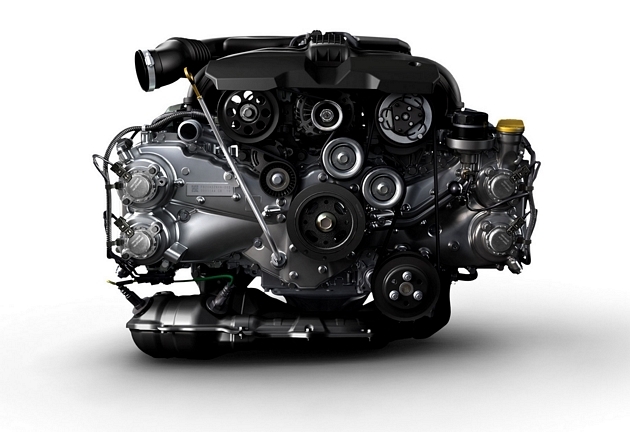 The third generation four-cylinder boxer engine have revised with a compacter combustion chamber and longer stroke, variable-valve timing (in Subaru abbreviation known as Active Valve Control System’) on both the intake and exhaust valves, lighter pistons and connection rods, a more efficient and compact oil pump and separate engine cooling circuitry for both the block and head. Most importantly, Subaru claims that fuel efficiency of the new engine is up by 10%. However, the power output of the 2.0 L naturally-aspirated engine (non-turbo) remains the same at 109kw / 150HP, while torque is up 5Nm to 196Nm. The new boxer engine has a slightly higher compression ratio of 10.5 (from 10.2), a shorter bore – 84mm (from 92mm) and longer stroke – 90 mm (from 75mm). Bear in mind, the specification varies depending on domestic models. Unfortunately, Subaru has yet to release details about changes to the 2.5-liter unit. Do stay with us and we will keep you posted once we got any first hand information on this.